Tishri was celebrated per God’s decree by the children of Israel as the ‘Festival of Booths’ and now by Scottish Rite Masons to commemorate the completion and dedication of King Solomon’s Temple. At our first meeting in September, we will participate in the Feast of Tishri, and then retire to the lodge room to install our 2018-2019 officers. 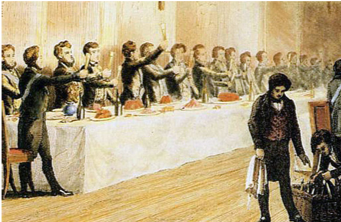 Our feast will be an excellent evening of Masonic Education and Masonic camaraderie. Ladies and guests are welcome. This event was inaugurated last year and was an evening well spent. It was illuminating to hear about the people and traditions of the King Solomon era since many of our own traditions come from those origins. This year’s celebration takes place in the Boughton Memorial (Lodge) Hall dining room beginning at 6:30 pm Thursday, September 13, 2018. We hope to have at least thirty in attendance. This year, we welcome Ill Bro Jerry Flora, 33º, IGH from the Northeast Kansas Valley as our very special guest speaker. Bro. Jerry is a Consulting Statistician. His presentation should reveal some very interesting findings. Join us for a great new tradition as we celebrate our Masonic roots.